Which is better: 10" or 12" speaker for lead guitar? Discussion in 'Amps and Cabs' started by PurpleHaze, Feb 24, 2008. 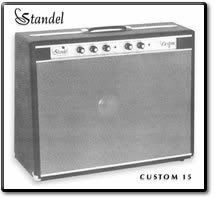 Which is better - 10" or 12" for low powered tube combo amp for lead guitar, home & practice? Not gigging. VERY subjective..."better" is what your own ears tell you...no matter what anyone else says. I tend to like the fatter lead guitar sound I seem to get with 12's. I think 12" is better for everything. Super Reverb is preferable to the Twin (sad to say). I have a super and have had many amps/cabs with 12's. 10's in a smaller club or hall seem to cut better. 12's can get lost in the mix. I'm pretty much sold on the 4x10 set up. I have gone through at least a couple of dozen speakers in the last 3 or 4 years alone. Jensen, JBL, Altec, Electro Voice, Celestion, Weber, Eminence 12"s. Celestion, Weber, Jensen, Laney, A Brown Soun and Eminence 10s. I used to think that 12" speakers were the best for guitar but I no longer have a favorite size. I definitely have favorite speakers but I have heard fantastic speakers in both those sizes and 15s as well for that matter. Neither. 15" all the way, baby! for home use wouldnt that be louder than 1x12 or balance out? Thanks for the great comments. Bosstone, what speaker is your favorite? For my purposes, it will be a single speaker in a smallish combo cabinet. The question about 10 or 12 speaker size is to help me select a cheap tube amps like Palomino V8 or V16 or Epiphone and some other low-watt amp. Any amp suggestions welcome? I want the best possible sound at relatively modest volumes. Hopefully with an excellent reverb. 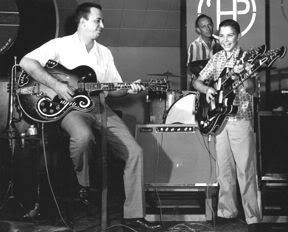 Chet Atkins Favored a Standell 25L15 always in his home studio and on the road till the late 80's. 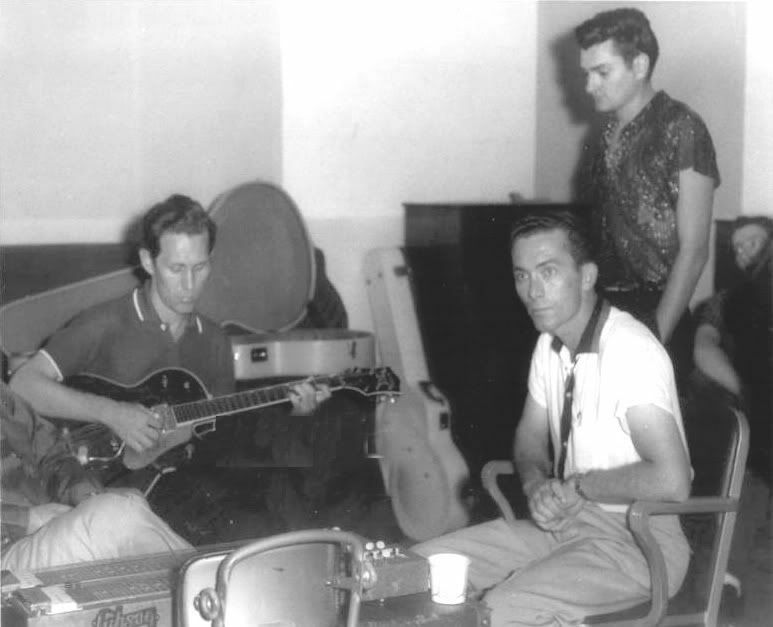 From Paul Yandell "For most of his recording he used his 1954 Standel miked with an RCA 44 ribbon mic. It had a JBL D-130. It was only 25 watts but Paul said it was a loud 25 watts. still the same original. JBL 15 inch speaker in it. He has used this amp on 98% of his records both for his electric and electric nylon string guitars. Chet's Standel has a great sound. It sounded better than the ones I had. 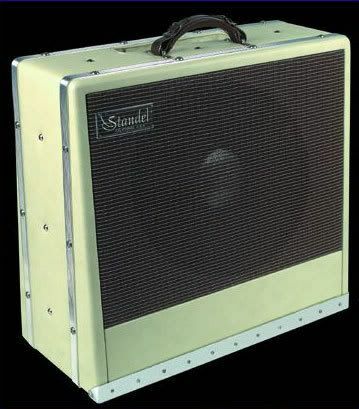 The Standel amp isn't very durable for road work. The way its made the power supply is in the bottom and the pre-amp in the top. If the airlines can destroy a suitcase, think what they could do to an old amp like that! When a person has an old piece of equipment you have to give it special care, Chet's amp has served him well all these years and is still going strong." 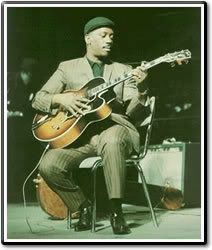 Wes Montgomery's 1965 70L15 Standel Super Custom XV, as used by Wes Montgonery. The 1965 version featured two channels. The Normal channel included: Volume, Treble, Bass. 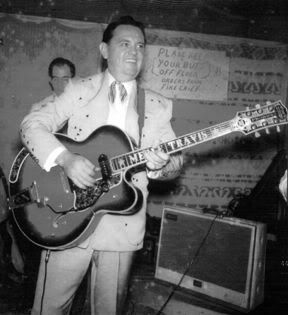 In the above photo of Wes he is shown playing through the Reverb/Vibrato channel which included: Volume, Treble, Bass, Contour (cut only), Reverb, Intensity and Speed. Of the new speakers I have tried I like the Weber Blue Pup and Silver Ten, both in the ceramic versions. As far as amps go, I don't really know what is out there in the lower watt amps or what speakers they come with. I have a friend who just got a Palomino V32 that he thinks is great but that is a 33 watt amp and beyond what is needed for practice. If everything else is the same, a speaker in a bigger cab always sounds better to me. If everything else is the same, a speaker in a bigger cab always sounds better to me. Typical small amp 12's are bigger, in a larger box and better quality that typical small amp 10's. No, a Mesa 5:25 is not a typical small amp. If I had to pick just one, I'd pick the 12"
I would pick a single 12" speaker over a single 10" speaker in most cases. I would pick 2, 10"s over a single 12" speaker in most cases. I would pick 4, x 10's over 2, 12's in most cases. I had a Vox Blue (12") w/2 Weber P10Q's (10's were both 16 ohms and the 12" was 8 ohms). Sounded great w/Bassman clone. Oddly, it ended up making the amp sound extremely close to my '66 Super Reverb. Check out the Vintone Simplex clips recorded with a single 8"
The Emery Sound Superbaby is another great choice.